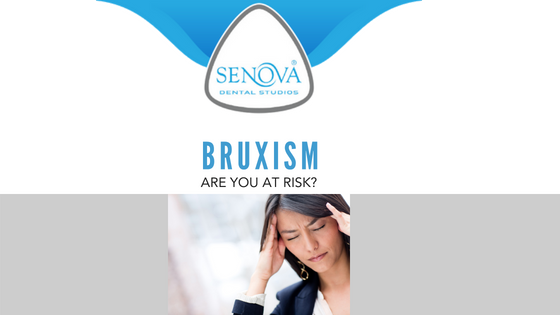 Bruxism - Are You at Risk? Bruxism – Are You at Risk? Bruxism – a cause of enamel degradation and tooth wear. What causes it, how to stop it and how to treat it. With the stress of modern day living more people are finding they have enamel degradation and tooth where from bruxism. This article is dedicated to helping those people and to helping you find a solution to teeth grinding /bruxism. This is the first stage in treating bruxism, if the underlying cause is stress then this will need to be addressed. If the underlying cause is something physical e.g. dental malocclusion then this can be treated with equilibration (selective and careful tooth grinding by the dentist to remove any cuspal interferences). Mouthguard can help you stop your bruxism by keeping your teeth apart. They usually fit on the lower teeth and will be custom-made for you. The surface of the mouthguard usually flat and smooth meaning your top teeth can’t lock together with your lover teeth. Exact causes of sleep bruxism are not actually known although there has been research which linkage to factors such as anxiety, alcohol, cigarettes smoking and stress. However, sleep bruxism is considered sleep related movement disorder and because of this if you have sleep bruxism you are statistically more likely to suffer from other sleep disorders such as snoring and possible sleep apnoea. Bruxism can go away depending upon its causes. If the bruxism is caused by anxiety, alcohol, cigarettes or stress then clearly reducing these factors will help with the bruxism. There may also be other physiological causes of bruxism which, unless treated mean that the bruxism won’t go away. We all grind out teeth a little bit, after all that’s what they are therefore, to enable us to grind food into small enough chunks to eat. Teeth grinding only becomes a problem when it affects things like tenderness in around the jaw muscles, headaches and tooth and bone loss. Your dentist will be able to diagnose the extent of any teeth grinding and let you know whether it is a problem for you. understand the cause of your teeth clenching and treat that, is it anxiety, alcohol, stress or cigarette smoking perhaps? Consider taking over-the-counter ibuprofen, this is a non-steroidal anti-inflammatory and can help to reduce pain and swelling. Always follow your doctor’s instructions and the labels on any medication. It’s not such an infrequent occasions that patients tell us the first thing they know about grinding their teeth and night is that their partner tells them… It can be a rather loud grinding noise! Other symptoms of night time grinding could be you wake up with headaches or pain around the jaw joint or muscles in your jaw. Teeth grinding is not a sign of sleep apnoea but the two conditions are link in that they are both sleep related movement disorders. There is no causal link between the two conditions but there may be other links worth investigating. Yes, you most certainly can get headaches from grinding your teeth, this is because the muscles which put your jaw together connect high up around the side of your head. If these muscles are under tension from grinding then this can be translated into headaches.